There are a variety of different training requirements in the construction industry that must be followed. This site is designed to help facilitate effective safety training programs for Bernhard MCC, its affiliates, and sub-tiered contractors. 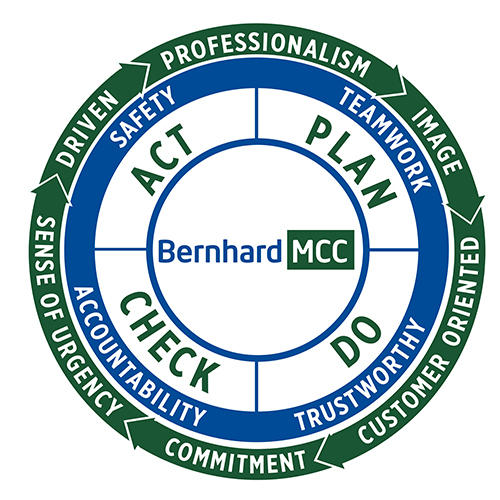 The goal of Bernhard MCC's Health, Safety, and Environmental Training Program is to teach our employees and construction partners to effectively recognize, evaluate, and control (or avoid) health & safety hazards. With the knowledge provided and a commitment to See, Assess, and Fix every challenge all workers can become effective safety leaders. ClickSafety is a recognized leader in online safety training and an OSHA authorized online provider of OSHA 10-hr and 30-hr training for both construction and general Industry. The course library also provides over 300 construction and general industry training courses that can easily be tailored to any personal hazard profile. Please reference the downloadable link to the left with a Course Catalog for course titles and descriptions. ClickSafety courses should be used in combination with other available training options (Internal training, monthly safety meetings, onsite quizzes, third-party safety training providers, etc). ClickSafety is Bernhard MCC's preferred provider of online safety training. Note: BMCC employees are required to obtain an approval from their BU Manager prior to registering for a course as their business unit will be invoiced for the cost of the course. Please reference the downloadable link to the left with the Employee Request for Online Safety Training. BMCC affiliates and sub-tiered contractors can self-register using the link to the left in the Subcontractor Training Portal.